Salad, Salad, Salad. . .
Say (curse, shout, whine, cry) what I will about this unbelievably rainy spell we’ve had, the lettuces and greens are glorious and bountiful. We have salads every night these days, the greens picked minutes before dinner. They are tender, sweet and addictive. Right now I have lots of arugula (not going to seed nearly as quickly as usual), mache (also known as corn salad, lamb’s lettuce or Feldsalat) and red oak leaf, and variety of green lettuces. And speaking of salads and before I forget, my next cooking class is Saturday 6/19 and will feature salads (and a guest chef!) and other fabulous dishes. Still spots left – sign up at Cook With What You Have! A few nights ago the salad needed to be the main gig for dinner. I had hard-boiled a few eggs earlier in the day since I like to have them on hand. I had some lovely new carrots from my CSA and a few beets. I scrubbed them well and without peeling either–I gave up peeling carrots years ago but more recently have quit peeling beets too, unless less their on the big side when the skin can get a bit tough–cut the carrots on the bias into nice chunks, the beets into small wedges and spread them out on a sheet pan. I sprinkled them generously with salt and olive oil and roasted them in a hot oven (425) for about 20 minutes until tender and slightly caramelized around the edges. 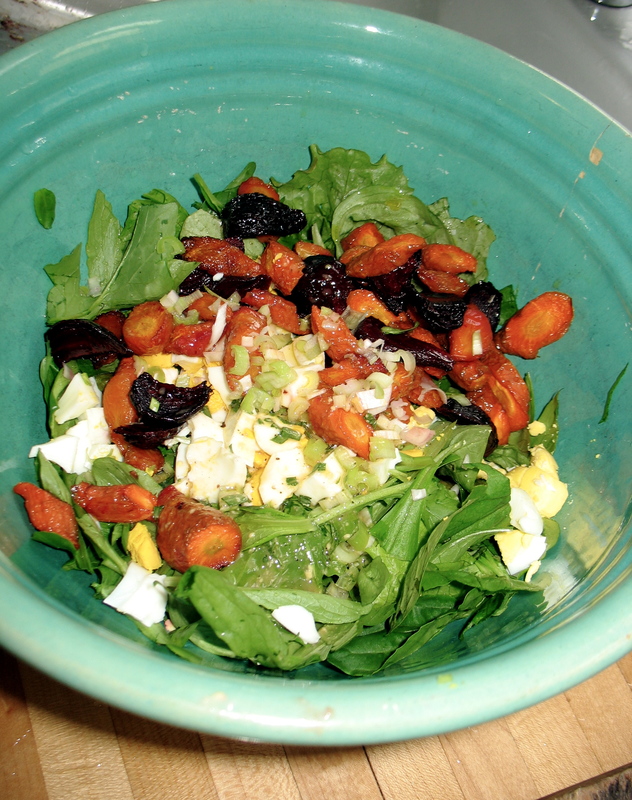 Meanwhile I washed and dried the greens, roughly chopped 3 hard-boiled eggs and made a dressing. Dressing was green garlic finely minced (of which I also have a lot in the garden and since I want the garden space for other things I’m pulling it all up now), fresh thyme, dijon-style mustard, lemon juice, salt, pepper, olive oil and a few teaspoons of my reduced apple cider. More on that later. 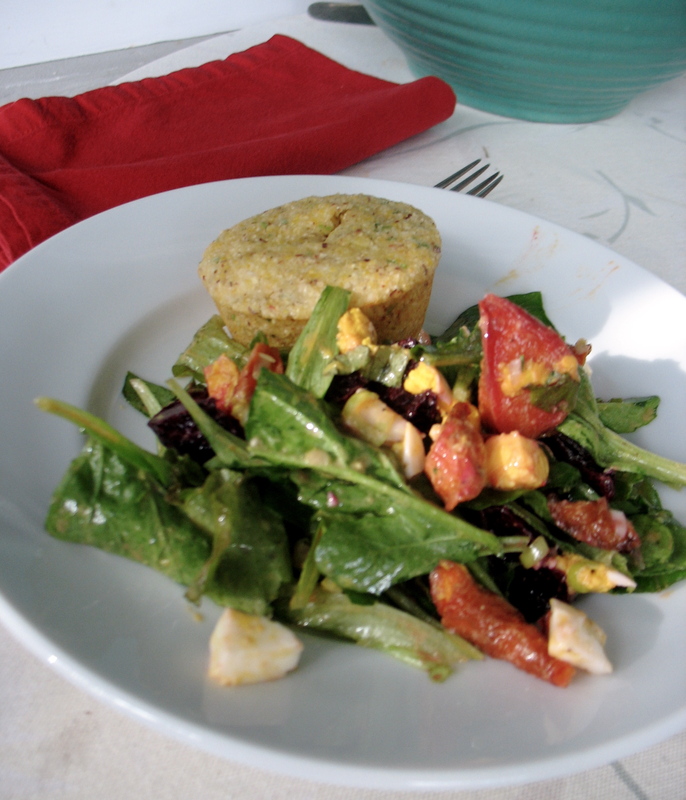 I tossed the greens with the roasted veggies, eggs and dressing and we sat down to a meal of this beautiful salad and warm cornbread muffins made extra good with sharp cheddar, chives and some chili flakes in the batter. Cornbread recipe to follow soon. 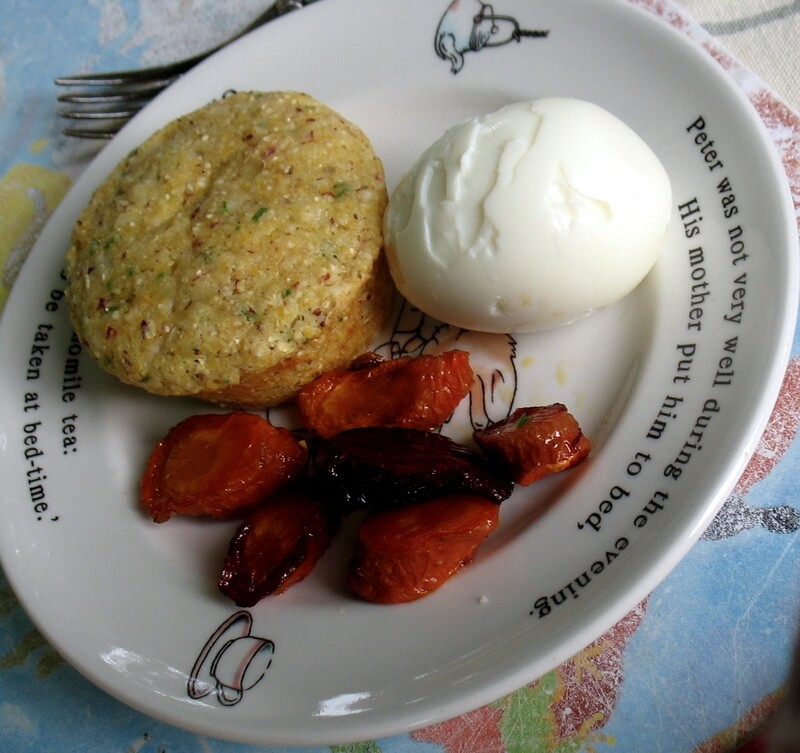 And if you can’t wait, it’s an adaption of a recipe from Michael Ableman’s Fields of Plenty. Try as I might, dressed green salads have yet to enter his repertoire. On a final note, it is supposed to dry out and warm up, albeit after yet another few days of rain, so next week I’ll have a pizza recipe, yes, with greens for you all! ← I Stared Down the Fridge and I Won! I really like the photos a lot. The rest of it too but the pictures are specially great this time. I always have the feeling that roasting a few vegetables in the oven uses a disproportionate amount of energy. ?? But I do think they always taste very good. I just tried some radish that were sliced thin, sauteed briefly in olive oil and dressed with a bit of balsamic. They were delicious on top of salad greens. As we do not have any carrots or beets to make our salads more interesting, this really worked for me. Roasted vegetables would be perfect as a salad. The roasting doesn’t take that long and I suspect that briefly cooking vegetables makes them more digestible which justifies the use of energy to achieve the results. Yes, I think you’re right about the energy Carol, and I like your radish idea. Hoping the sun comes through again today. Warmth, we need warmth!